Summary: The global growth of social media as a mainstream trend is the subject of regular news headlines these days. Yet the assumption is that most enterprises are either taking a wait-and-see attitude or are hopelessly behind consumer trends. The surprise is that enterprises have actually been holding steady behind the consumer world as they look towards the future of their workplace. A post by Forrester here on ZDNet this week pondered the question of whether social software is actually relevant to information workers. Noting that “only” a third of all workers currently report using social media in the enterprise, Forrester noted that — by their count — nearly half of firms today are now investing in social tools in their organization. I would observe that many software verticals would do just about anything to have these kinds of numbers. Yet author TJ Keitt notes that the adoption of social software now seems to be increasingly represented by higher-paid, more influential, and senior workers in the organization. Fully half of them are managers by Forrester’s calculation. 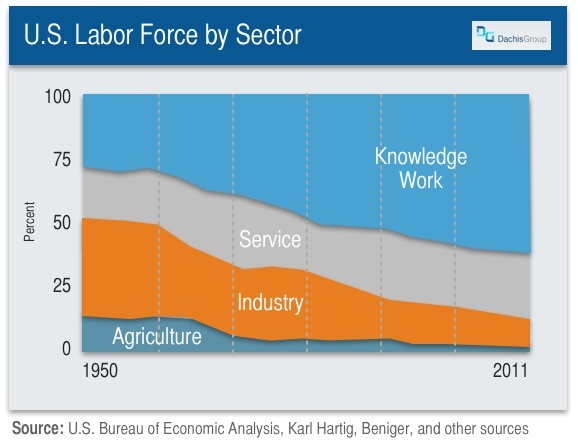 This makes sense if knowledge work is a dominant feature of the 21st century economy, which happens to be the case. It also makes sense if workers higher in the org chart believe that social tools convey strategic advantages in some way, such as providing increased access to information, collaboration across silos, and tasks conducted in a more project-based way. These are top benefits reported by users of social software in McKinsey’s latest Web 2.0 results survey. These numbers and trends are also in alignment as these issues are the concerns of managers more than they are line workers. I would suggest that these results actually show an important — and relatively recent — shift in usage (from line workers to management) that’s been needed for real change and deeper adoption of social tools. As I’ve examined in the past, senior leadership can have some of the most dramatic effects on the uptake on social software. It also is clear that after five years, penetration of social software is now quite extensive, though it’s still not as strategic as it could be for many organizations, largely due to obstacles I’ll explore. In reality overall adoption of social software in the enterprise has been surprisingly solid overall considering the headwinds of technology adoption in most businesses. The obstacles themselves are legion: 1) There are already numerous communication and collaboration technologies that exist in most businesses today. 2) Enterprise social software has had to mature and gain the capabilities that enterprises require that aren’t usually present in consumer social media. 3) Creating effective social architectures isn’t the core competency of most IT departments or their users. And 4), not the least of these obstacles is that enterprises usually adopt technology much more slowly than individual consumers or the overall marketplace. I’ve tracked the adoption of consumer social media and Enterprise 2.0 (aka internal social business) over the last five years and it’s clear that there’s about a 2x lag in enterprise adoption of social software. In other words, while most of the consumer world uses social media today, large organizations have been adopting social media at about half the speed (see chart.) In addition, enterprise adoption of social software in no way means everyone in that organization has started using the capabilities. In fact, most adoption follows the famous S curve, which means early adopters show up much earlier and saturation causes it to level off as the late majority shows up. I’ve been studying social software adoption patterns in the enterprise and early critical mass is often as little at 20% and stays there for some time. Are we done with early adoption? While consumer social media has grown in leaps and bounds to the majority of the developed world (now 65% of all adults according to Pew), enterprises are generally holding steady behind this trend and are not closing the gap or falling behind (see chart above), despite clearly lagging due to the headwinds cited above. I should also note that a a good amount of enterprise adoption of social media is not as transformative and widespread as, say an IBM or SAP, which both have impressive stories in this space. But most of the world does not consist of technology companies, so most organizations are trying to find their own way forward with social media. Complicating the picture, we are also entering an era where software solutions are going to be much more numerous, diverse, and narrowly targeted. My post last week, for example, was a great case study in how social BI was used to analyze internal social media to create a specialized expertise location app. This means that hyper-specialized social apps based on domain-specific areas like location, inventory, customer service, and more will greatly outnumber their big platform brethren. The rise of social app stores and mobile apps with social features will both increase enterprise adoption considerably, but it will also ensure that adoption will take on very different patterns and move more organically and via unique pathways to different parts of the business. In other words, internal social business is becoming more granular, more business specific, and consequently harder to track in traditional terms. 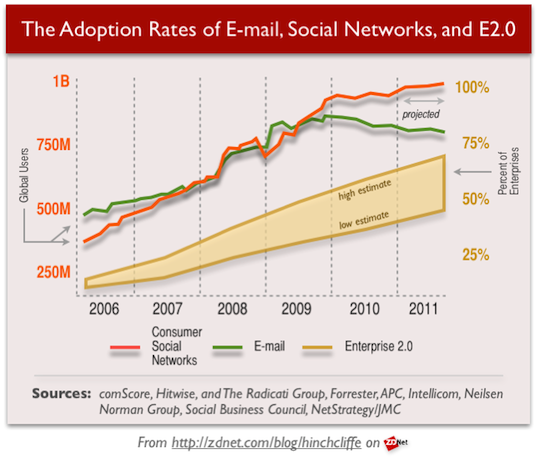 Social business: How big then? Another way that’s often used to cross-check the adoption rate is by estimated the total size of the enterprise market for social software. Gartner has pegged the social business market at right around $1 billion for 2012. Dennis Howlett recently attempted to do the same, given that Jive’s recent IPO filing perhaps hints at a maturing of the space, speculating on whether the total value is $1-$5 billion. This is a small fraction of the nearly half-trillion dollar size of the total software industry by 2013. Pre-existing or “stealth” social platforms. For example, SharePoint — often shored up byNewsgator for a full range of social features — still represents up to half of all medium and large enterprise collaboration implementations, yet its costs typically get come out of the content management budget. In addition, SharePoint is often already paid for or otherwise bundled in enterprise licenses such that it’s hidden in the budget. It will continue to have a large presence in internal social business for the foreseeable future despite it’s perceived shortcomings as a modern social business platform. Open source social media. Anecdotally, I see a great many social business efforts using WordPress, Mediawiki, Drupal, and Joomla, which are free and mature platforms. While open source, enterprise-class support is available for these platforms, they are in no way nearly as expensive as the Microsoft, IBM, and Jive’s of the world. Cloud software. Enterprises have a rapidly growing set of options in the cloud, many of which are many times less expensive that the ones from top tier vendors. The bottom line is that there is virtually no doubt that social media is currently making its way into the enterprise in a very substantial, broad-based way. What is far less clear is how strategically organizations are actually engaging in social business. Initially, social software will be used as a simple communication improvement, while more visionary firms will apply it far more deeply and transformatively. What’s intriguing to me here is that there are actually a good many obstacles for Enterprise 2.0 adoption to overcome. Yet despite these issues, it’s holding holding a pretty steady tack behind the consumer world and not appreciably falling farther behind. What’s interesting to here is not which tools are currently on top, the total amounts spent, or how far behind organizations might be, it’s that despite the deep conversations recently about the importance of closing the loop between social software and business context, most firms have already made significant moves to a more social future. 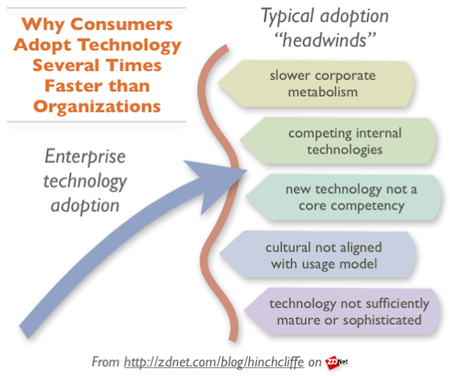 What we know now: With the current numbers, it’s essentially official (by definition) that are leaving the early adoption phase, having broken through the initial barrier of just getting into most organizations. Especially with use of social tools now climbing the org chart, we can look forward to on getting beyond initial experiments and to the more significant and practical discussions focusing on improving the way we work.